A Colorado landlord made news this week by battling a tenant’s request to keep a “companion” cat without paying a deposit or additional pet rent. According to the news report, the woman claims that the companion cat was intended as treatment for stress related to an abusive marriage. The pet policy for the building requires the payment of a deposit, and an additional monthly increase in rent, presumably to offset the potential damage the cat may cause. The woman complained about the additional restrictions for the cat, calling it a “companion” animal, a buzzword in housing discrimination. Recently, HUD — the enforcement branch for the Federal Fair Housing Act, has been prosecuting landlords who require deposits or extra rent for tenants with animals that are used to treat medical conditions. HUD rulings have made it clear that the provisions in a lease regarding pet restrictions cannot be applied to “companion” animals. One case involved a child whose physician prescribed a companion dog to treat his autism. The apartment building where the family lived had a strict no-pets policy. The landlord responded to the request by setting out conditions in a special pet agreement, including the requirement that the family buy an insurance policy, a limit on the amount of time the dog is alone in the apartment, a weight restriction, and a rule that the dog be muzzled when it is in common areas. HUD has also made it clear that the animal does not have to be a dog. One HUD ruling suggests cats — and ferrets, are viable alternatives for companion animals. In another recent ruling, HUD has suggested that a landlord cannot ask whether the animal is trained, as is often the case with “service” animals. HUD has indicated that the terms “companion” and “service” animals are interchangeable and the same rules apply. For instance, a companion animal must be allowed into all areas of the rental property where the tenant is allowed, including in one case the laundry room. Through its grant priorities, HUD has committed to increasing its assistance to persons with disabilities to maintain companion animals in rental housing. 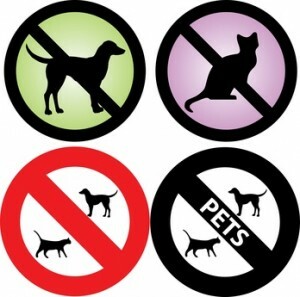 If landlords cannot charge a deposit for potential damages, and they cannot restrict where the companion animal is at any moment or which type of animal will be adopted, can they at least restrict anti-social behaviors in the animals, like excessive noise or aggression towards other tenants or other animals on the premises? It would appear that the HUD regulations do take into account the safety of other tenants. While landlords cannot enforce general pet provisions in the lease, in one instance a HUD representative suggested that a landlord could still enforce provisions in the lease relating to noise restrictions or nuisance. In fact, the companion animal is viewed as an accommodation for a person with a disability, and as such, must be reasonable and not create an undue burden. However, HUD has shown little sympathy for a landlord’s financial losses if the animal damages the rental property. Applying the rules to specific situations can be tricky. For instance, take the case of a current tenant with a “companion” dog who has lost interest in picking up the dog’s feces from the common area walkway of a “no-pets” building. The landlord and tenant had previously agreed that the tenant would hire a clean up service every three days. The tenant is now hedging, questioning whether she should have to pay for the service. This case is not yet under investigation by HUD, and there is no clarification how far the landlord can push the issue without risking a discrimination complaint. The Federal Fair Housing Act does not apply to every landlord. Many smaller landlord businesses are exempt for the federal rules. However, each of the states is free to pass their own housing discrimination rules, many of which are more restrictive than the federal rules. Typically, the states follow the guidelines set out by HUD. A tenant must qualify as a person with a disability in order for the animal to be exempt from pet rules. In the Colorado case, the tenant initially brought her request to the property manager. It is not clear whether the tenant already owned the cat prior to obtaining the medical authorization for a companion animal. Later, when the landlord would not waive the deposit requirement, the tenant went to the local news to garner support for her position. She told reporters that the cat calms her down, and makes her happy. The property manager in this case confirmed that they had been trying to work something out for two months, according to the report. A couple of days after the newspaper ran the woman’s story, the landlord succumbed to the tenant’s request, and waived the deposit, pet rent and resulting late fees. The manager told reporters that the concession was offered only because it was at this time that the woman provided proof of a medical condition. What medical professional is qualified to “prescribe” a companion animal? Licensed Physician, Psychiatrist, psychologists (can’t dispense pharmaceutical prescriptions in my (and most) states). “One HUD ruling suggests cats — and ferrets, are viable alternatives for companion animals.” Does this mean that a landlord can choose which companion animals that will permit as long as they allow at least one type? Pet Agreement signed by both tenant and landlord? I’ve been fighting for service cats & Even took my state to court & they agreed after I did . I have studied the Federal law on companion / service cats & NO landlords CANNOT TELL a tenant NO on a service/ companion animal if you have a allergy . If you have a disability & have a service animal you take to work & others have allergies that ISN’T a LEGAL for their employer to do anything or say anything to them without being construed as discrimination. It’s the Same for landlords & charging more rent & or deposit for service/ companion animal . I hope this helps your PROBLEM?? Is there a limit on how many companion animals the disabled can have in Colorado. someone I know has 2 and they what to know if they must get rid of one of them after having them for 2 years. They are depressed and upset and crying over the situation. My mom recently became physically disabled due to her heart and I hate leaving her home alone as I have moved out and must take care of my own family now. I am thinking of getting her a companion pet (probably a cat) but she lives in hud housing in south carolina and they don’t allow pets. Do they have to allow such pets by law and does she just have to ask her doctor for a “prescription” or is there more to it? Can HUD tell you what size or breed of dog you can own if it is a companion animal?? I live in Oregon and have a been approved for a companion animal/dog an I am wondering if they can make me get a small dog, because many others have big dogs here. I am getting a puppy though, so it is not like im just moving in and they are denying my dog. I just need to know if they can put restrictions on the type of puppy I get. I find it very selfish on the part of tenants to FORCE a landlord into something financially damaging, like no pet deposit. It does not matter what the law says, a person is selfish if they ignore the economics involved. A landlord has expenses and those should be addressed by two mature adults, not by FORCING your will upon someone via HUD and their discrimination towards landlords. I am very thankful for the hud law about companion animals. I was recently diagnosed with a non curable cancer and having a companion animal makes a huge life altering difference in the way you perceive every day you wake up. Animals in my opinion should be treated as a family member especially if they have such a positive impact on life.